Our schools have been severely underfunded for decades. Maryland’s public school children have the Constitutional right to an equitable opportunity to attend healthy and safe schools that provide high quality education. One step toward delivering on that right is to increase funding for education. We, as Maryland residents, have the chance to raise our voices and demand it. There is an important statewide ballot initiative that all Marylanders will be asked to vote on this November. It will be Question 1 on the ballot, and voting FOR would make sure that casino revenues go to increasing public school funding. This will mean an additional $500 million annually for our schools. Black and Brown children, and families living in areas of concentrated poverty are impacted the most by current and past education funding levels. Voting FOR Question 1 will keep a promise made to voters that casino revenue would increase school funding instead of being used for other purposes. While casino revenues have been going into the Education Trust Fund—which can only be used for funding public education—nearly the same amount of existing funding has been shifted from education to other parts of the state budget. The result? The new revenue from casinos hasn’t added to existing funding; it has simply maintained the existing levels. Passing Question 1 will stop the budget gimmicks and ensure that casino revenues actually go to increasing school funding over current levels. With Maryland schools underfunded by $2.9 billion annually, voting FOR Question 1 will take a significant step to closing that gap. We know that funding is sorely needed by our students, who only get one chance at a strong K-12 education. They deserve equitable and adequate school funding that delivers lasting opportunity in every single Maryland community. Voting FOR Question 1 is the first step to closing the funding shortfall and making this vision a reality. When Question 1 passes, ACLU will fight to make sure the increased funding is used equitably to decrease racial disparities and the differences in wealth amongst jurisdictions across Maryland. From all of us here at ACLU of Maryland, we hope we can count on you to say, “YES, I will vote FOR Question 1 in November! 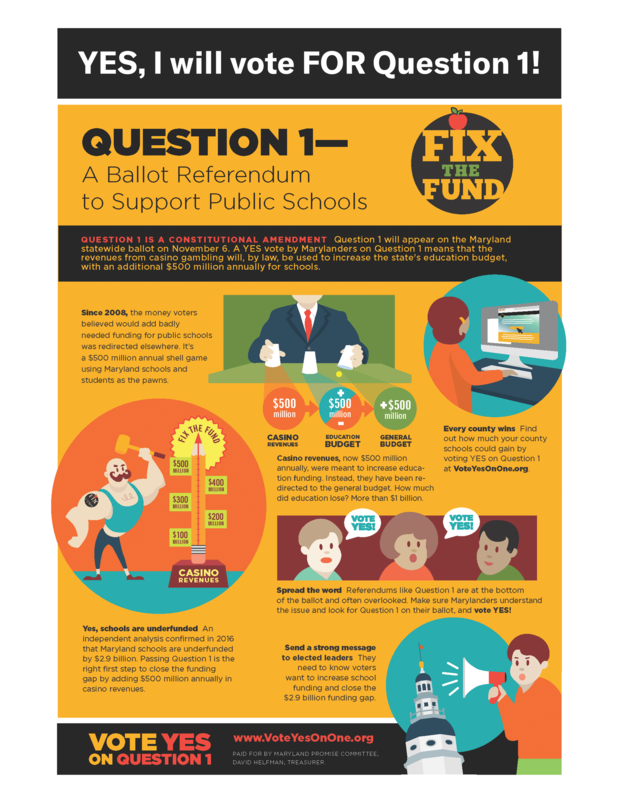 For more information on Question 1, visit VoteYesOnOne.org.